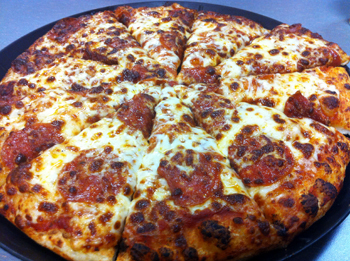 Chuck E. Cheese’s New Pizza & 3 Giveaways! 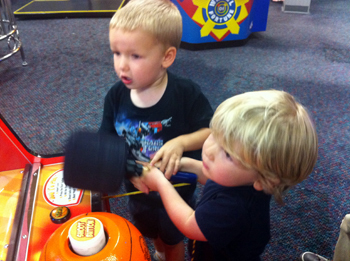 The boys LOVE going to Chuck E. Cheese. 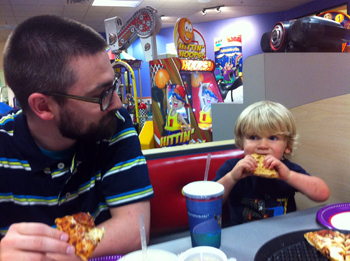 The games are a good fit for their ages, and what child doesn’t like eating pizza? 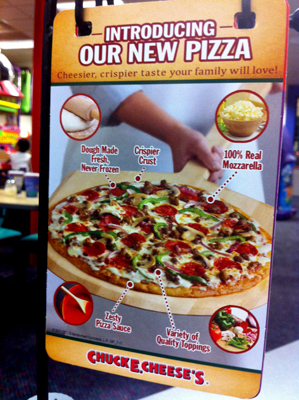 Well, now we’ll all enjoy going to Chuck E. Cheese even more because they’ve completely revamped their pizza recipe! We got the chance to review the new pizza recipe, and the timing worked out perfectly so we could go on J’s birthday and make it a special treat for him and C.
If you’ve never been to Chuck E. Cheese before, they stamp each person’s arm with a number in UV ink, so that when you leave they can make sure children are leaving with the correct adults. I love that they take that precaution (and the kids think it’s cool to be stamped with a “magic” stamp that only shows up under the special light). When we arrived, the greeter asked if we were celebrating any birthdays. When we told him yes, he made J feel really special, giving him a sticker and some extra tokens. What a great start to our evening! I was impressed with the customer service throughout the entire evening – I know I’m writing a review about their pizza, but the whole experience of a place is important to me, and great customer service makes me want to be loyal to a business. We ordered our large pizza, and a few minutes later an employee came out to let me know they were out of larges (we were there toward the end of the day) – then he asked if it would be ok if they provided us with two medium pizzas instead. Perfect! 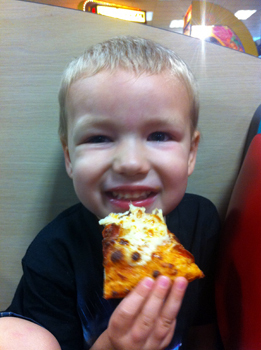 He apologized for the inconvenience, but we were happy because it meant more pizza! We ordered pepperoni, but there are a lot of other ingredients available too. We all thought the pizza was great! I only had one bite because I’m sticking to my Freshology diet, but I wanted to be able to report back my thoughts too. The crust was that great balance of crispy on the bottom and slightly chewy too, and there was a good amount of sauce (well-seasoned), cheese and pepperoni. Brian said he liked it a lot and it rated up there with some of our go-to pizza places. Yup, it was a hit! It was a really fun evening with great food – and we ended up with enough leftovers that the boys could have pizza again last night too. 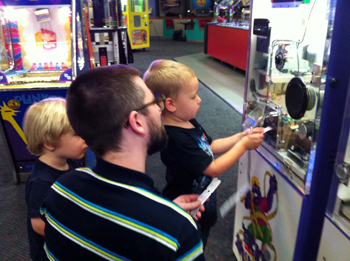 THREE lucky readers are going to win your own fun time at Chuck E. Cheese! 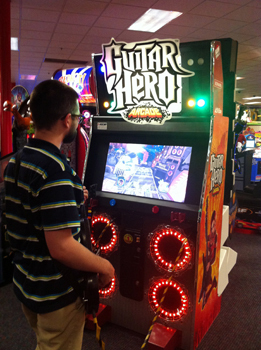 Each winner will receive a Guest Pass Card, which provides you with a large pizza, four fountain drinks, and 30 tokens. 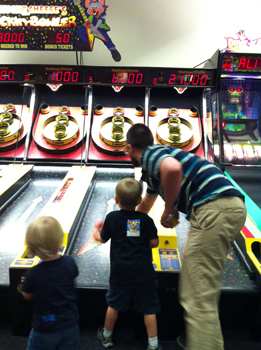 Your kids will think you’re the greatest, and you’ll get a fun family night for free! 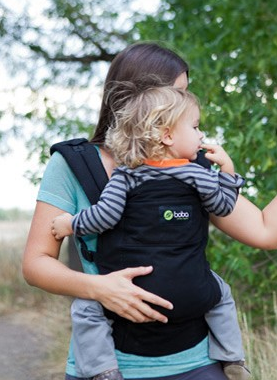 This contest is open to all U.S. residents. Entries will be accepted until the end of the day (midnight CST) Thursday, September 1. Mandatory Entry: Comment telling me what your favorite pizza topping(s) is/are! Note: I was provided with a Guest Pass for the review, along with three Guest Passes for the giveaway. All opinions provided are honest, and are those of myself and my family. I liked Chuck E. Cheese on fb. I just like extra cheese.